A pineapple fish hiding under a ledge, these fish are nocturnal and found in caves and under ledges and overhangs in the day, they have bioluminescent spot near the eye to assist with hunting and are quite heavily armoured. They are only regularly seen at one site in Sydney which is an aquatic reserve. The resemblance to a pineapple is complete down to the curved spine on each segment. The specific name means "glory of the seas". Olympus OM-D EM-1 MkII + Panasonic 30mm macro, Nauiticam housing, INON strobes. The similarity is remarkable! What is to the right of the fish? That’s interesting too. Very cool capture and explanation. Love it. Fine portrait, it does look like a pineapple. Very cool capture- what a wonder to see! 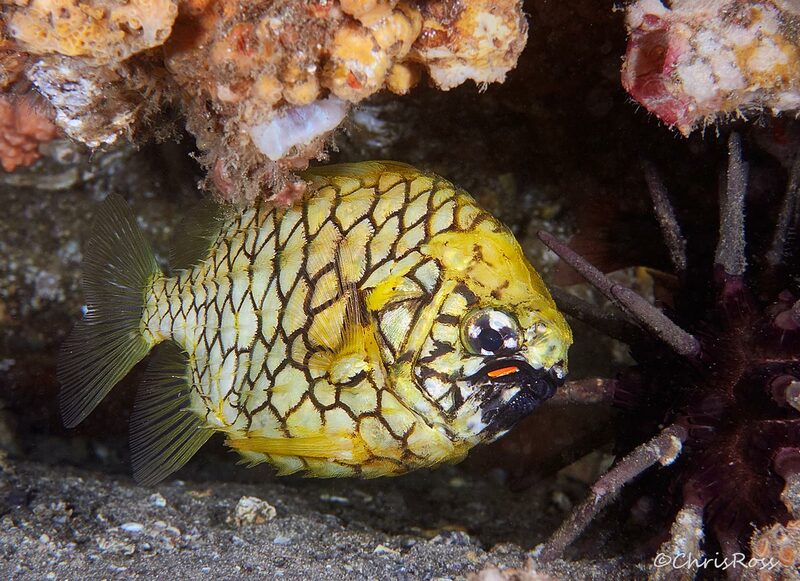 Love the infinite variety in nature and what you find in the deep-now why would a fish look like a pineapple?! Obviously spikes and tough "Armor" is functional, but it is an interesting resemblance to the fruit. Thanks for sharing.